You'll want to wash your fabric however you plan on cleaning it once you've finished. So if you plan on washing it and drying it on high heat, then do that to your fabric before sewing with it. Jones & Vandermeer shared with me that there is some shrinkage to this fabric I chose. She had made some baby pants out of it, and had to pre shrink it. But she was impressed with how beautifully the fabric held up to the super hot wash and dryer settings. The colors stayed vibrant and the material stayed durable yet soft. I, however, am a self-proclaimed lazy slacker and pretty much dry clean everything. So, I didn't pre-wash it at all. Since these instructions are in Japanese, it was necessary to thoroughly review all the pictures, and piece together what I needed to do. There were a few things to do that I didn't have to with the muslin. One of which was the interfacing. Where to place the interfacing. These instructions indicate using a fusible interfacing at the hems of each piece. 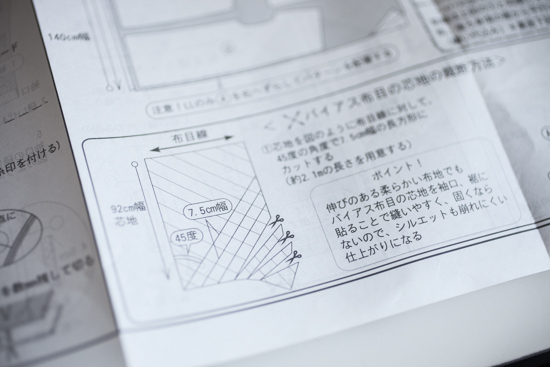 The instructions also indicate cutting the interfacing on the bias for maximum amount of stretchiness. How clever!! There is knit/tricot interfacing which is very stretchy. But if you only have woven interfacing on hand, this is a nice workaround. I am definitely not clever enough to have thought of that on my own. I used Pellon's Shape Flex SF-101 ("Stacey") interfacing. It seems to be a great all-around, general-use fusible woven interfacing. Per the instructions, I cut out the necessary strips on the bias for the hems on the fronts, sleeves and back. Use the 45° marking on the ruler for bias strips. Once the first 45 degree cut is made, you can simply line up the ruler and cut the desired width from there. This particular fabric is only 32" wide. Much narrower than the average 44"/45" or 58/60" wide fabric I'm used to finding. In total, I needed about 4 yards. I have a lot of the Nani Iro Double Gauze, but I had never worked with their Double Knit. It's very similar in that two pieces of very lightweight fabrics are held together by tiny stitches about 1 cm apart. 4-pindot markings are the stitches keeping the fabric layers together. With the fabric folded in half, I cut the back piece along the fold and cut both front pieces at the same time. However, the sleeves were too wide to fit on the folded fabric. So I opened up the fabric and cut out one sleeve at a time. A word of caution: If you're cutting out the sleeves one at a time, don't forget to flip over your pattern piece so that you have one mirrored sleeve. The slope of the cap is not symmetric, so it's important you don't make two of the same. With all the pieces cut out, I ironed on the fusible to the bottom edge of the fronts, back and sleeves following the instructions. I used a piece of muslin as a pressing cloth so none of the sticky fusible would end up on my iron. Pressing cloth keeps the fusible off of the iron. Finally - onto the serging! So, I bring the two fronts to my serger and start zooming along. I noticed a bit of bunching under the foot, but didn't think much of it. I thought it was the softness of the fabric that was sort of sticking to the feed dogs. Fabric bunching under the presser foot. But I took out my piece and realized that I had left my differential feed at 1.5. When I flipped over the pieces, the bottom piece was fed through more quickly than the top. The fabric differential when using the differential feed. Whoops! Now onto what every owner of a serger should know: how to rip out an overlock stitch. This two-minute video is the best explanation and illustration of how to rip out a 4-thread overlock stitch that I've found. It's short, clear and concise. And like most things, when I learned how to fix a mistake is when I truly understood how it worked. Following her instructions, I removed one needle thread, then the next. Then, the looper threads were free to simply fall off. By stretching that seam, all the threads kind of popped out which was cool. As I continued along, I found I needed to hold the fabric pieces together. I try not to pin when I don't have to. It's fussy, warps the fabric and is time consuming. But this particular knit fabric tended to drag and stretch, so I needed to use something. Since this knit is fairly soft and delicate, I didn't feel comfortable using pins. So I used these clips instead. Clips instead of pins to hold pieces together. They're Clover Wonder Clips, and they're really handy. I'm a big fan. Strong enough to do the job, but they don't leave a mark. And, they're really obvious so there's almost no fear of forgetting about them as I serged along. Baby Lock's Cover Stitch Machine all threaded and ready to go. I'm pretty sure I've already mentioned what a lazy slacker I am, so this should come as no surprise to you. Even though my lovely serger has the ability to convert to do a cover stitch, I went out and bought a separate cover stitch machine. I had once done a project where I had to convert it back and forth maybe two or three times, and that was enough. I think I ordered it the next day. So what's a cover stitch? A cover stitch is pretty much an overlock stitch that isn't over the edge of fabric, but actually on top. So the needle threads are visible stitches on the top, and if you flip over the fabric, the looper thread zig zags back and forth between the needle threads. As for the machine, it's different from a serger in that there's no cutting, so no blade, and only one looper thread. It's usually used for hemming knits, which is why I pulled it out. Generally, a cover stitch is comprised of 3 threads - 2 needle threads running parallel to one another, and 1 looper thread. The reason for using the cover stitch instead of just hemming normally is to accommodate the stretchiness in the fabric. A cover stitch won't "pop" if you stretch it to put your hand through a cuff for instance. I went ahead and set up my machine for a wide cover stitch. I think I like the look of a narrow cover stitch more, but the wide cover stitch makes it easy to catch the raw hem. Here, I'm hemming a cuff. Cuff turned inside out, cover stitching from inside the cylinder. Unlike a serger where the fabric is fed into the machine, the fabric should be underneath the needles and presser foot before beginning. Raw hem lined up with the middle line on the throat plate. Because I'm cover stitching a small circumference, I turn the piece inside out, and then serge from inside. When I lift up my piece I can see that my raw hem is lined up with the middle line on the throat plate. Since I set this up for a wide cover stitch, the left line and the right line indicates where the needles are. So as I cover stitch along, I barely even look at the top of the fabric - I have it lifted up so I can see that it's being fed straight through following that middle line. The two lines of stitching are from the two top needles. To finish off something in the round, keep going until you get to the beginning and stitch over those first stitches by about an inch or so, and that's it. Use the presser foot's guide lines to stitch right over previously stitched lines. 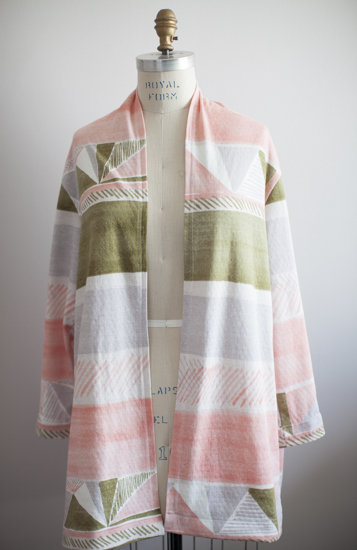 After completing the cover stitching of the cuffs, hem and the cardigan's opening, my Robe Cardigan was all done! I'm still wondering what I can wear this with. Once I figure that out I'll post a modeled pic of it. Well, I've got 8 more days left in Serger Month... what else can I make? !